Two young women join a dangerous expedition combing through the rubble left behind from countless past solar system civilizations in "Revenger" (Orbit, 2017), the latest book by prolific science-fiction writer Alastair Reynolds. The book was released today (Feb. 28) in the United States. Space.com: How is "Revenger" different from your other science-fiction stories? 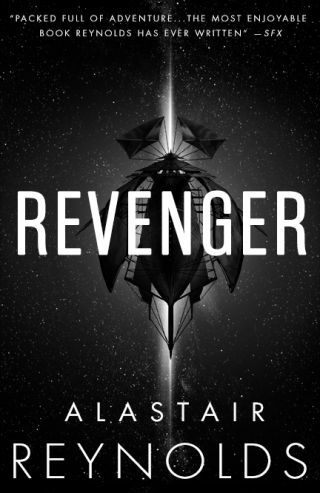 Alastair Reynolds: "Revenger" is my 14th or 15th novel, depending on how you count them. I had written a lot of science fiction over the years that's very — I suppose you could say is quite strongly grounded in semiserious speculation about physics and cosmology and engineering and space travel, because I have a background in space science. For "Revenger," I wanted to do something that was a little bit looser, that was more in the direction of science fantasy. Alastair Reynolds, author of "Revenger," is a former space scientist and prolific science fiction writer. It's very, very far future, it deals with a cast of characters that don't fully understand the rules that govern their universe: They have some theories, but they're not entirely sure about how some things work and why things behave the way they do. And they're living in a culture where — they're human, or humanoid, but there've been many, many previous civilizations that have come and gone, and every time one of these civilizations comes and goes, they leave behind relics and technologies and artifacts that stick around for millions of years, and they can be found and reutilized by the characters in the book. But they don't always quite understand what they're using, or the dangers. It's a pick-and-mix culture that lives off the relics and detritus of past civilizations. The technology that the humans have direct access to is never that advanced; it approaches the level of wireless sets and early radar — maybe some television — but it never goes beyond that. Although they're doing space exploration, it's all very perilous, because the ships are only held together by spit and prayer. Space.com: How did that setting come together with the space pirate adventure story? Reynolds: About 10 years ago, I started writing little notes to myself about a possible future project which would involve teams of explorers who have this occupation where they have a limited amount of time to break into some sort of alien structure or artifact — where they have to get in quickly, get the treasure, but they're not really sure how long they've got inside before the doors shut again. It's a sort of "Indiana Jones"-type scenario where you've got to raid the tomb and then get out quickly. I thought that could be fun … but I couldn't quite find the right way into the story. And then a few years later, completely unrelated to that, I started writing notes about an adventure series that would be set in our own solar system, but so far in the future that all the planets have been dismantled and reforged into tiny little asteroids — little independent worlds that have their own ecosystems and gravity, drifting around the sun in a Dyson swarm of microplanets. I thought that could be fun, because you can have millions of different cultures and civilizations, much as you would in the "Star Wars" universe, but you wouldn't need hyperdrive to get from A to B. You can just use existing space-navigation technology — ion drives or solar sails — because nothing would be that far apart. Space.com: Was writing from a more first-person perspective very different from your usual process? Reynolds: I've done quite a few short stories over the years, and I've used various voices and viewpoints in my short fiction, but I'd never really written a novel from a first-person viewpoint, and I've never written a novel from the viewpoint of a teenage girl, either. [It was a challenge] to tell the world from her point of view, through her eyes … I tried at all points to think, Well, what would she know at this point in the story? What would really concern her and what would she not be that bothered about? One of the dangers of science fiction, particularly bad science fiction, is that you have these scenes where the characters turn to a blackboard and start explaining how this faster-than-light drive works, or something like that. We never really have those conversations in real life. That's not part of the way we interact as human beings. I try to avoid that in my fiction, but I was particularly determined to avoid it with "Revenger." … There's going to be things in there that don't seem to make sense or are not clear. But if you go with the flow, then hopefully the wider setting and its rules will start to come into focus. Space.com: The characters seem to have little understanding about how the alien tech they encounter works. How much of that did you fully work out? Reynolds: if you're creating a whole universe, even if it's a universe squeezed into a solar system, you have to use a little bit of sleight of hand. I liken it to one of those old-time Wild West stage sets where the shop fronts look quite convincing, but when you walk around the back, it's all just plywood — it's propped up, and it's all quite rickety. That's how I approach world building as such — I try to shore up the bits that really matter and then try to bluff my way around the rest, because it would just be completely impractical to completely work out every single aspect of an invented world. That's not what attracts me to fiction, anyway. Some things you just have to take on the fly and almost deceive the reader into thinking that you know things better than you do. I just trust that, if there's alien technology behind it, and it doesn't violate the laws of physics, then there's an explanation somewhere. Space.com: Do you think that a community of microworlds could really develop in the future? Reynolds: I read a nonfiction book a long time ago that — I've picked up on a few other science fiction writers who've also read the same book, because we're riffing off some of the same ideas in it. [That book is "The Millennial Project: Colonizing the Galaxy in Eight Easy Steps" (Little, Brown and Company, 1992) by Marshall Savage] I don't think the guy ever wrote anything else … It's a nonfiction book, but it's also a kind of pedagogical manifesto-type book where the guy is trying to lay out his ideas for what future human civilization should look like. It's all a bit cultish, in a way — you read it with a slightly skeptical frame of mind, because it's very utopian and cultish in the way he describes things. But one of the things — an image in that book that really struck me — was the idea that he's talking about energy utilization in the very far future. And he says that if we're serious as a civilization about expanding and moving into space, his hobbyhorse is that we need to actually expand the human population massively. As he says, the more billions of us there are, then the more geniuses there will be. He's all for creating trillions of human beings around the sun — far more than the Earth could sustain. He has this idea that we move into the solar system and take all the rubble and reforge it into lots of little planets that have their own ecosystems, and they're like little glass balls with forests inside them, basically, and everyone lives in these little balls and moves around between them. Space.com: If humans were to spread out on a large scale beyond Earth, do you think humanity is more likely to be constrained to the solar system or to establish far-off outposts? Reynolds: I used to be a strong believer that we would eventually colonize the solar system the way it's been done in science fiction many, many times: bases on the moon, Mars colonized, move out to the outer planets, then we go to the next solar system and build a colony there. I don't know now — I'm not as convinced that's the way it's going to pan out. I just think space exploration — it's not that it's difficult, as such, it's not that we couldn't do it, but my suspicion is that we will be demotivated, we will be less and less motivated to colonize interstellar space as we mature as a civilization. As our collective knowledge base increases, we may reach a point where we say, well, actually, we don't need to go anywhere, because the information is with us. We can do what we like with the information; we can inhabit these worlds through virtual reality if we choose, we don't actually need to be physically present. And if we do need to go and extract samples, we can send robots, and it doesn't matter if they take 1,000 years to get there, they can report back when they arrive. I'm a little bit less inclined to believe the grand science-fiction dream of interstellar colonization. I think it's still an interesting idea to play with in fictional terms, but if I had to put my money on it, I'd say it's probably looking less likely now than when I started my career, even though it's only 15 years. Space.com: And there's plenty in the solar system already. Reynolds: Why would you need to expand beyond the solar system, if you already have access to all the information you need, and you've essentially insulated yourself against a planetary apocalypse? Maybe that's enough. And the solar system's a huge place, anyway. It's a truly mind-boggling place — that's one of the disservices that science fiction has done to us, particularly in the last few decades — is make the solar system seem cramped and homely and not particularly interesting. But the solar system is enormous, and we don't have a clear sense of how far out it goes, anyway. Pluto is by no means the end of the solar system: There's vast tracts of trans-Neptunian space beyond Pluto, and then there's the Oort cloud, which is like a tenth of the way to the next solar system. So there's a hell of a lot of real estate there that we haven't even begun to scratch the surface of. This interview has been edited for length. You can buy "Revenger" on Amazon.com, and read an excerpt here.